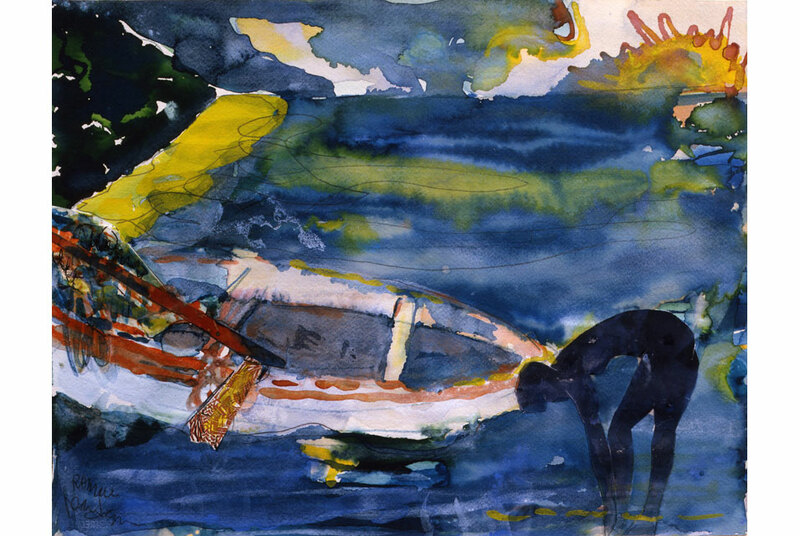 Romare Bearden, Martinique Morning, 1987, Watercolor and collage on paper, 13 x 16.75 inches. SAN FRANCISCO, CA.- Jenkins Johnson Gallery presents Romare Bearden: Storyteller, running through June 21, 2014. The exhibition features collages, watercolors, and prints from the 1970s and 1980s by Romare Bearden, a descendant of the Harlem Renaissance, a great storyteller, and a master colorist. Romare Bearden (1911-1988), an author, visual artist, songwriter, and jazz aficionado, is recognized as one the most creative and important artists of the 20th century, even spurring a centennial celebration at dozens of national museum including the Studio Museum in Harlem. Migrating from Charlotte, North Carolina to New York when he was a toddler, Bearden quickly became part of the cultural fabric of New York City. His family’s house was a meeting place for major figures of the Harlem Renaissance, including writer and social activist Langston Hughes and Bearden’s second cousin and early patron Duke Ellington. A member of the Harlem Artist Guild and founding member of the civil rights group The Spiral, as well as of the Studio Museum in Harlem, Romare Bearden played a key role in the evolution of black arts and culture throughout the 20th century.